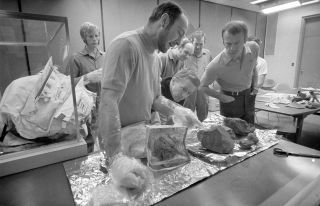 NASA astronauts show journalists some of the rocks they collected during the Apollo 14 mission. THE WOODLANDS, Texas — Thanks to the Apollo missions, scientists have their hands on hundreds of pounds of lunar rock right here on Earth. But because of a twist of fate, it isn't quite enough to solve a puzzle that has annoyed lunar and planetary scientists alike for more than two decades. That puzzle has to do with calculating how old different areas of planetary (or lunar) surfaces are. The older a patch of such an object is, the more it has been banged up by pieces of rock flying through space. Scientists can't make such connections in Earth's active crust. But by bringing samples of the moon into terrestrial labs, where they could be precisely dated, the Apollo program let scientists build a conversion rate of sorts between just how many craters dot a certain surface and how old it is. There's just one problem: There's a stretch of nearly 2 billion years of lunar history that scientists can't pin down, because there aren't any young rocks in the Apollo samples. "The moon is the only place where we have this consistent set of samples that have been age-dated and we know precisely where they came from," Dave Draper, manager for astromaterials research at NASA's Johnson Space Center in Texas and principal investigator for the potential mission, told Space.com during the Lunar and Planetary Science Conference being held here this week. "Just one more sample can fix this tool that is used across the solar system." So, Draper and his colleagues are hoping NASA will sign on to a mission the researchers will propose in July that would find a missing puzzle piece and make the crater-counting tool more robust. If the agency likes the idea, called the Inner Solar System Chronology (ISOCHRON) mission, it could launch as early as 2025. NASA has turned its eyes to all things lunar in response to President Donald Trump's Space Policy Directive 1, which prioritized eventual human exploration of the moon. But the crater-dating puzzle isn't a new problem; it's been frustrating scientists for decades. And it isn't just about lunar science; scientists apply the crater-aging scale developed on the moon to every other rocky body in the solar system. That includes Mars, where a detailed understanding of how geologic features relate across time would help NASA place the first Martian astronauts on sites where they could do the most compelling geology research. And while those astronauts could start a new crater-dating scale, why bother? "You could make a Mars-centric crater-count model, but you would have to go to a whole bunch of different places on Mars and sample a whole bunch of different-aged things so you could come up with a nice model," Draper said. "You'd be starting from a blank piece of paper. Here, most of it's filled in. We just need to get that gap filled in." And fortunately, Draper and his team know exactly where to go to do so: a young lava flow just south of Aristarchus Plateau. Conveniently, it makes for a nice place to land a spacecraft. It's smooth and nearly featureless, so there's nothing to trip up a lander and leave it stranded. "This is a true statement: This is literally the safest place in the solar system to put a lander down, because it is so flat," Draper said. The moon's craters aren't only beautiful; they also help scientists identify the ages of different patches of the lunar surface. Once ISOCHRON arrives, all the lander would need to do is grab a sample — about a third of a lb. (150 grams) — tuck it away, and head back to Earth. And scientists, with that sample in hand, will be able to do more than just fill in the dating gap; they can also study it like any other lunar sample. The last mission to bring pieces of the moon home was the Soviet Luna program, which concluded in the late 1970s. But ISOCHRON likely won't be the first lunar sample return to break this long spell. China, whose Chang'e 4 mission touched down on the far side of the moon earlier this year, is planning to send a sample-return mission to follow as soon as the end of this year. Draper said that unlike many comparable missions NASA has run, like the Messenger mission to Mercury and the Dawn mission to the asteroid belt, this one is fairly straightforward, given the amount of science it would facilitate. Scientists know precisely what they need from the moon, and they know precisely what to do when that material arrives. After all, it's the same sort of analysis that's been done for decades on a host of other samples; they just need one more to fill in the gap. "To a knowledgeable reviewer, it literally fits on a bumper sticker," Draper said of the ISOCHRON science motivation. "I don't have to go through pages and pages of nuance to try to convince them what this problem is about. They're gonna go, 'Oh, yeah, we've known about this problem a long time.'"